A two-vehicle Shelburne Falls accident involving a 2005 Ford Freestyle and a Harley-Davidson motorcycle claimed the life of a 60-year-old motorcyclist, The Republican reports. The Ford Freestyle was struck after turning left onto Route 2 and crossing the path of the Harley, which then hit the vehicle. Boston motorcycle accident attorneys know that as the interest in and ownership of motorcycles continues to tick upward, so has the number of motorcyclists killed and injured each year in traffic accidents continued to climb. According to the National Highway Traffic Safety Administration, in 2008, almost 5,300 motorcyclists were killed and 96,000 motorcyclists were injured in traffic accidents nationwide, revealing a decade-long upward trend in both fatal and injury-causing motorcycle accidents. In Massachusetts, 41 motorcyclists died in crashes in 2008. Among the most common accident circumstances – representing 41 percent of fatal accidents involving a motorcycle and motor vehicle – the other vehicle was turning left at the time of the crash. In 2008, left-turn crashes claimed the lives of 985 motorcyclists. ~ Obtain proper state licensing and complete a rider-safety training course before taking a motorcycle on the road. 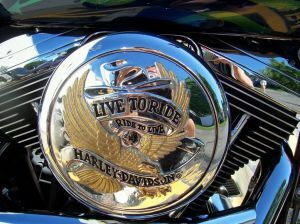 ~ Make sure the bike fits the skill, experience and ability of the rider. In this case, size matters! ~ Because motorcycles lack basic structural protection, motorcyclists should always wear protective gear – gloves, goggles, a helmet and boots – that offer additional protection in the event of an accident. ~ Because of their more supple maneuverability, weather conditions can create more hazards for motorcyclists than for other motor vehicles. Before getting on the bike, scan the radar. Be aware of the local weather forecast and road conditions. ~ Perhaps most important: motorcyclists need to ride defensively and ride thinking they are invisible to other motor vehicles. Never ride in a car driver’s blind spot. Boston motorcycle accident lawyers at the Law Offices of Jeffrey S. Glassman, LLC, have more than 18 years experience handling serious and fatal traffic accident cases and representing those injured or killed in a Massachusetts motorcycle accident. If you have been injured or someone you love has been injured or killed in a Boston-area accident, talking with an experienced attorney can help you better understand your rights. To schedule a free initial consultation, contact us online or call our offices at 1-877-617-5333.